In this post, we look at leveraging T4 templates to extend the power of LLBLGen inside of Visual Studio .NET. Writing T4 templates to auto-generate code is almost a norm at this point it seems, it’s built-in to ASP.NET MVC, and used as a first-class tool in most ORMs. So why not use T4 templates to extend the power of LLBLGen as well. While I like to write LLBLGen templates, I’ve found using T4 templates to be a nice addition to LLBLGen in the VS.NET toolbox. Let’s get to it. Writing T4 templates to auto-generate code is almost a norm at this point it seems, it’s built-in to so much of ASP.NET MVC, and used as a first-class tool in most ORMs it seems. So why not use T4 templates to extend the power of LLBLGen as well. While I like to write LLBLGen templates, I’ve found using T4 templates to be a nice addition to LLBLGen in the VS.NET toolbox. Create a .NET 4+ class library project (or console, whatever you like really), you don’t need to have any of the LLBLGen assemblies as a reference in the project (you will need a licensed copy of LLBLGen on your machine however to execute the T4 templates, since working with the LLBLGen application APIs will require it, unless you have a small project with less than 8 entities, in which case you can use LLBLGen Lite). Install the “T4 Toolbox” extension (you don’t need this extension, but it’s a really good one, and I’m using it in this short post ;-p). Also, in this post, I’m using the T4 TemplateFileManager library file (just an additional *.tt file), which will help us in generating files inside the project. You can also get it as a nuget package (“Install-Package T4.TemplateFileManager”). You’ll notice I put the LLBLGen project “Northwind.llblgenproj” in my project, but you don’t have to do that. You can just point to the project wherever it is on your file system, that’ll be fine too. This is just convenient for me for this post. There are two files that matter here, the “Toolbox.ttinclude” file, and the “Northwind.tt” file. The first is just a container for functions and stuff like that. The second file is where the T4 code that leverages LLBLGen APIs goes. Here’s the code in this file that generates some POCOs for each entity in the LLBLGen project file. The code generation and APIs are similar to the ones you would use in creating LLBLGen templates. The code below to load an LLBLGen project from a file is provided courtesy of the LLBLGen support team. 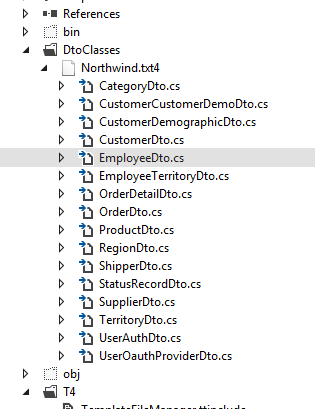 And the DTOs are all created nicely within a custom folder: “DtoClasses”. Now it’s up to your creative juices to figure out what you want to do. Coupled with the LLBLGen QuickModel editor (command line creation of your entities, fields, entity relationship), entity grouping, multi-database support, LLBLGen templating, custom properties, settings, custom plugins, value types, and custom TypeConverters (which I use to serialize complex types into nvarchar fields with the ServiceStack OrmLite Jsv and Json serializers), support for EF, OData, OrmLite (with these simple T4 POCOs, just need to add better attribute annotations), it’s pretty powerful stuff :-). That’s all folks, hopefully this will be useful to someone out there. Cheers. Frans, thanks, that’s a lot simpler 🙂 , post updated. Good tip on referencing the db drivers too.